Not All Biscotti Are Created Equal Sometimes a cup of coffee is simply not enough. Sometimes a cup of coffee needs a biscotti. But not just any biscotti. This baton-shaped Italian cookie should be dense, chunky, dunkable -- and noisy till the end. Get recipes for Traditional Italian Almond Biscotti, Anise, Orange And Pignoli Biscotti, Cherry, Pistachio And Vanilla Biscotti, Chocolate-Dipped Espresso Biscotti With Kahlua Icing, and Maple Walnut Biscotti With Maple Icing. Sometimes a cup of coffee is simply not enough. Sometimes a cup of coffee needs a biscotti. On a recent snowy afternoon in New England, I ordered just a cup of coffee at a cafe. That is, until the girl behind the counter asked me, "Would you like a biscotti with that?" "Sure," I replied, without hesitation. When the biscotti was placed in front of me, I was suddenly stricken with buyer's remorse. ... The real disappointment was the dunk. I flash-dipped the biscotti into my latte — any longer, and I feared it would melt altogether. When I pulled it out, it was sadly soggy. I bit into it, and it didn't crunch. Not even a crackle — there was silence. When the biscotti was placed in front of me, I was suddenly stricken with buyer's remorse. It had more holes than a kitchen sponge. When I picked it up, it was as light as a meringue cookie. I counted three almond slivers in the whole slice. The real disappointment was the dunk. I flash-dipped the biscotti into my latte -- any longer, and I feared it would melt altogether. When I pulled it out, it was sadly soggy. I bit into it, and it didn't crunch. Not even a crackle -- there was silence. If I know one thing about good biscotti, it's that they're noisy little confections. That's because they're twice baked, resulting in a crunchy, firm, perfectly dunkable cookie. The word biscotti is derived from the Latin biscoctus, meaning twice baked or cooked: The dough is formed into logs, baked, cooled and baked again. 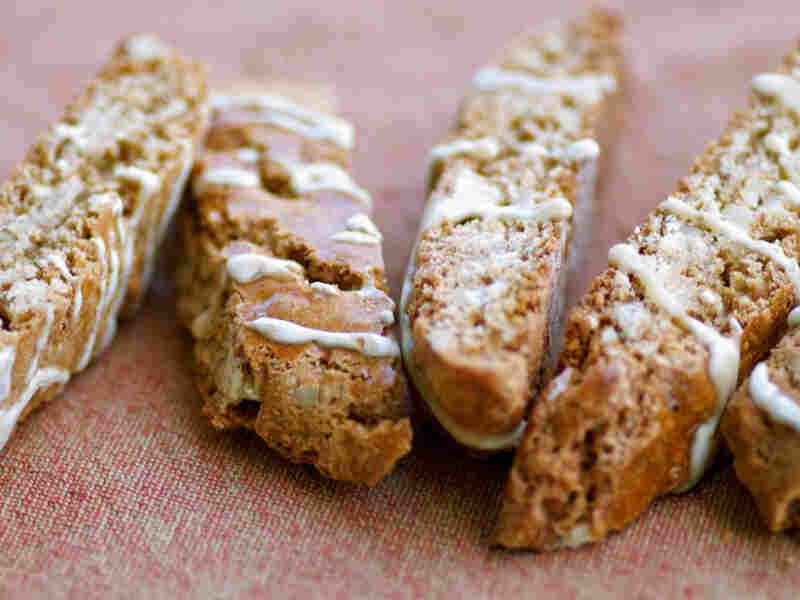 Whereas Italians use the word "biscotti" to refer to various cookies, Americans use the term to refer to the singular long, crisp, twice-baked Italian cookie. The biscotti found in stylish cafes today have utterly common origins. The first biscotti, often referred to as Biscotti di Prato, were created in 14th-century Tuscany in the city of Prato and were made from almonds, which were abundant in the region. Because the second baking drew moisture out of the biscuit, it rendered the biscotti hard, sturdy and, importantly, resistant to mold. Consequently, biscotti turned out to be the ideal food to store. They soon became a favored provision of sailors, including Christopher Columbus, who traveled at sea for months at a time with the crunchy cargo. It didn't take long for other nationalities to discover the utility of these twice-baked biscuits. British hardtack -- a twice-baked, dry, hard biscuit made from flour, water and salt -- and German zwieback -- a twice-baked, crisp, sweetened bread -- are both spinoffs of the Italian original. Susan Russo is a food writer in San Diego. She publishes stories, recipes and photos on her cooking blog, Food Blogga. Her latest cookbook is Recipes Every Man Should Know. When she isn't writing about her Italian family back in Rhode Island or life with her husband in Southern California, she can be found milling around a local farmers market buying a lot more food than two people could possibly eat. Biscotti continued to flourish throughout Italy as well, with various regions creating their own specialties from local ingredients such as pistachios and sesame seeds. Different regions in Italy also call biscotti by different names. Tuscans, for example, call biscotti cantucci. 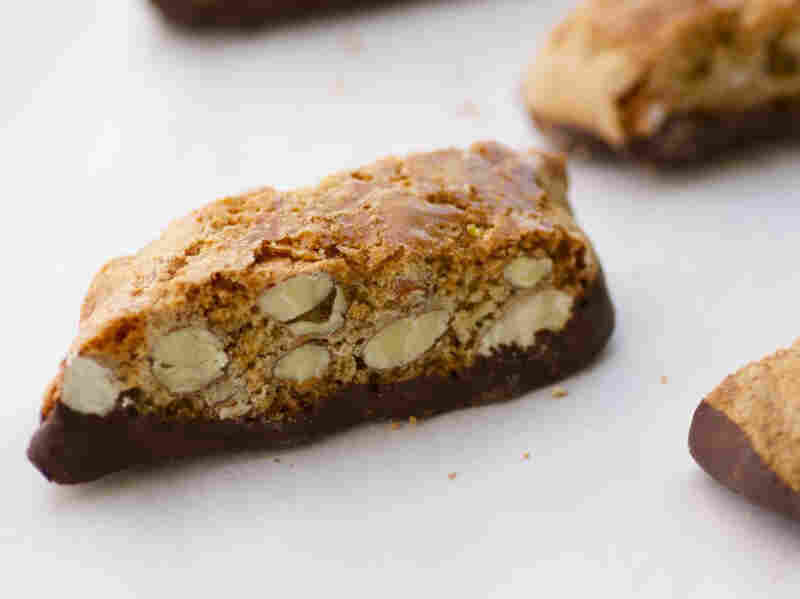 It wasn't until the 1990s that biscotti became a treasured American favorite. We needed something to nosh while sipping our pricey gourmet coffees, so why not a pricey Italian cookie? Soon biscotti were everywhere: at elegant Italian restaurants, in hip cafes and even on humble coffee carts. 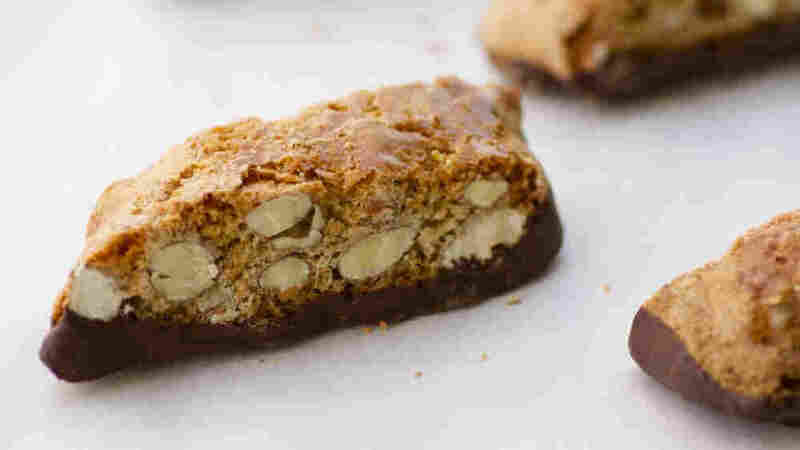 Food writers dubbed biscotti the cookie of the '90s. Today, biscotti come in an endless array of flavors. Classics such as almond, anise and hazelnut contend with flashier up-and-comers such as gingerbread, maple walnut and mint chocolate chip. 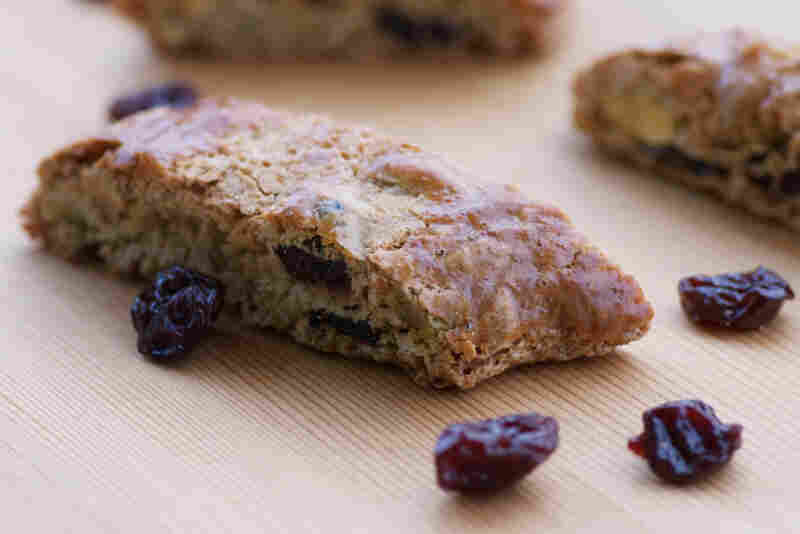 There are also savory biscotti made with various cheeses and herbs that are lovely when paired with a charcuterie plate, an assortment of olives and cheeses, or even a bowl of soup. Despite their centuries-old heritage, there is no one perfect way to make biscotti. Some recipes call for eggs only, which is the traditional method, while others swear by butter or oil. The choice is yours; just keep in mind that those made with butter or oil will have both a softer texture and a shorter shelf life. As for fillings and flavors, biscotti get along with a host of ingredients, including dried fruit, nuts, spices, liqueurs and chocolate. You can't go wrong with classic flavor pairings such as rum and raisin, chocolate and orange, or cranberry and pistachio. Of course, you can always make up your own. Don't worry too much about ruining biscotti. They are a remarkably forgiving cookie. Is the dough too dry and crumbly? Add another egg. Is it too sticky? Add a bit more flour. Did you leave them in the oven too long? No worries. Mark them as dunkers only. Like most confections, the more you make biscotti, the better you'll get at it. Biscotti are time-consuming, but they're also one of the easiest and tastiest cookies you'll ever make. No special equipment is needed; just a bowl, a spoon, a couple of baking sheets and some parchment paper. As for eating them, anything goes. Enjoy a biscotti with a glass of milk for breakfast on the go, savor one with a glass of Italian wine for a luxurious afternoon snack, or dunk one in a cup of steaming milk for a late-night indulgence even Christopher Columbus would have liked. And the next time you're at a cafe and the girl behind the counter asks if you would like a biscotti with your coffee, ask to see it first. Because no one should ever experience buyer's remorse when it comes to biscotti. Always preheat the oven. Check your oven temperature to ensure that it's correct. Position oven racks in the upper and lower thirds of the oven, and rotate sheets halfway through the baking process, to ensure evenly baked and browned biscotti. Baking requires precision, so unless you're an old pro, it's best to use the exact ingredients specified in a recipe the first time you make it, rather than use too many substitutions that can adversely affect both texture and flavor. Keep in mind that variables such as different-sized eggs, varieties of flour and quality of extracts all affect biscotti. So try to use the best ingredients you can afford. Be patient. When mixing the biscotti dough, you may find that it's dry and crumbly. Persevere. Use your hands to gently squeeze the batter until it begins to form a dough. If it's really dry, you may need to add an extra egg or some other liquid related to the recipe such as extract or liqueur. Conversely, if you find your batter to be really wet and sticky, then you will likely need to add more flour. Add it in small increments, and test the dough as you go. It's OK if the dough is slightly sticky. Just keep both the countertop and your hands lightly floured as you form the logs. Place no more than two biscotti logs on a baking sheet, since they will spread as they bake. Try not to bake on a humid day when biscotti (as well as many other cookies) spread more and are softer. If you have to, place the unbaked logs in the refrigerator for about 20 minutes before placing in the oven. 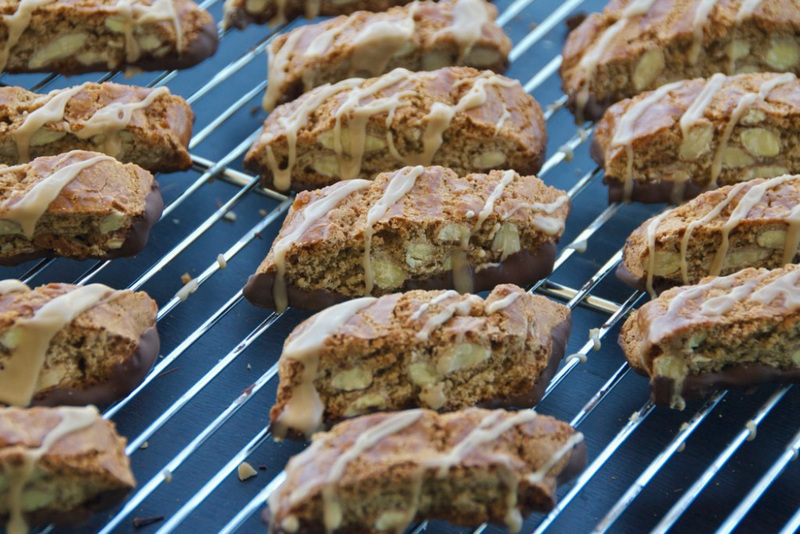 After biscotti are baked once, allow them to cool for about 20 minutes. Too much longer, and they will become too hard to slice. When slicing biscotti, always use a serrated knife in a sawing motion, which reduces crumbling. Place sliced biscotti on their sides back on the pans for the second baking. Here you have options: You can bake them at the same temperature for 10 minutes; you can reduce the temperature to 200-300 degrees and bake for 20 minutes; or you can turn off the heat completely and place the biscotti in the still-warm oven anywhere from 30 to 60 minutes. The longer they stay inside the oven, the harder and crisper they will become. Let biscotti cool completely before garnishing with chocolate or icing. Cool biscotti completely before storing, preferably in a metal tin, which will help maintain crispness. If stored too quickly or placed inside of a paper or plastic bag, biscotti will visibly soften. In that case, place the cookies in a 300-degree oven for 10 to 15 minutes to crisp again. When storing decorated biscotti, place them between sheets of waxed or parchment paper to protect them from bumping against each other. Most biscotti, when properly stored, will last up to one month. My mom's almond biscotti are satisfyingly firm rather than jaw-breakingly hard and are chock-full of toasted whole almonds and laced with fragrant orange zest. They are ideal for dunking in a mug of hot coffee. This recipe calls for 3 jumbo-sized eggs. If you can't find them, then use 4 large eggs. One of many potential riffs on the Traditional Italian Almond Biscotti is a chocolate-dipped version. Position racks in the upper and lower thirds of the oven and preheat to 350 degrees. Line 2 large baking sheets with parchment paper. Place almonds in a single layer on a baking sheet and toast in the 350-degree oven for 10 minutes. Remove and set aside. In a large bowl, hand mix toasted almonds, sugars, cinnamon, baking powder and flour. In a small bowl, whisk eggs. Add the vanilla and orange zest and whisk until well blended. Add to the flour mixture. Stir a few times. Work the batter together with lightly floured hands. The mixture will be sticky, but persevere. Keep squeezing the batter with your hands until a dough starts to form. Once the dough is firm, form a ball. Divide the ball into 4 equal pieces. On a lightly floured surface, place 1 piece of dough, and using your hands, roll into a log shape that is approximately 8 inches long, 2 inches wide and 3/4 of an inch high. If it's sticky, simply dust your palms with more flour. Repeat with remaining 3 pieces of dough. Place 2 logs per baking sheet. Brush loaves all over with lightly beaten egg. Bake for 40 minutes, rotating pans halfway through, or until the tops of the loaves are shiny and deep golden. Cool on a rack for about 20 minutes before slicing. Place a loaf on a cutting board. Using a large serrated knife, cut 3/4-inch-thick slices, either straight or on the diagonal. Use a sawing motion to prevent crumbling. Each loaf should yield 9 to 11 cookies. If the cookie is crumbling, then let it cool a few more minutes. Don't let it rest too long, however, or it could become too hard to slice. Place slices on their sides back on the baking sheets. Place in the still warm oven with the temperature off and the door closed for 30 to 60 minutes. The longer they stay in the oven, the harder they will become. Remove from oven and cool completely before storing in an airtight container, preferably a tin, which helps keep them crisp. Stored properly, biscotti will last up to a month. Italian pignoli nuts, or pine nuts, are prized for their sweet flavor. They're available at Italian specialty markets as well as most supermarkets. 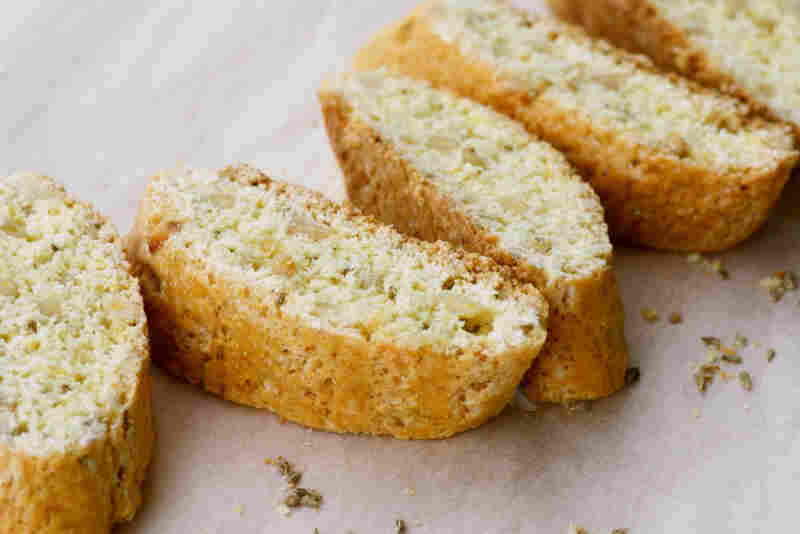 Though made with sugar, these biscotti lean toward the savory side and make a tasty companion to Italian deli meats such as prosciutto and salami, and cheeses such as asiago and pecorino-romano. Position rack in the center of the oven and preheat to 350 degrees. Line a large baking sheet with parchment paper. Place pignoli nuts in a single layer on a baking sheet and toast in the 350-degree oven for 8 to 10 minutes, or until just golden and aromatic. Remove and set aside. In a large bowl, hand mix toasted pignoli nuts, sugar, baking powder and flour. In a small bowl, whisk eggs. Crush the anise seeds using a mortar and pestle. If you don't have one, then place anise seeds in a small Ziploc bag and seal. Place on the countertop and lightly roll over the bag with a rolling pin. Place crushed seed in a small nonstick skillet over low heat. Warm 3 minutes, or until just aromatic. Remove from heat and add to the eggs along with the anise extract and orange zest. Whisk until well blended. Add to the flour mixture. Stir a few times. Work the batter together with lightly floured hands. The mixture will be sticky, but persevere. Keep squeezing the batter with your hands until a dough starts to form. Once the dough is firm, form a ball. Divide the ball into 2 equal pieces. On a lightly floured surface, place 1 piece of dough, and using your hands, roll into a log shape that is approximately 10 inches long, 3 inches wide, and 3/4 of an inch high. If it's sticky, simply dust your palms with more flour. Repeat with remaining piece of dough. Place both logs on the baking sheet. Brush loaves all over with lightly beaten egg. Place a loaf on a cutting board. Using a large serrated knife, cut 3/4-inch-thick slices, either straight or on the diagonal. Use a sawing motion to prevent crumbling. Each loaf should yield 10 to 12 cookies. If the cookie is crumbling, then let it cool a few more minutes. Don't let it rest too long, however, or it could become too hard to slice. Place slices on their sides back onto the baking sheets. Reduce oven temperature to 200 degrees, and bake biscotti for 20 minutes, until toasted and crisp. If you desire, you can turn off the oven and let the biscotti stay for up to an hour. The longer they stay in the oven, the harder they will become. Remove from oven and cool completely before storing in an airtight container, preferably a tin, which helps keep them crisp. Stored properly, biscotti will last up to a month. What I love best about these biscotti is the sweet vanilla fragrance that fills the kitchen as they bake. Of course, with tart dried cherries and earthy pistachios, I don't mind eating them, either. Place pistachios in a single layer on a baking sheet and toast in the 350-degree oven for 8 to 10 minutes, or until just golden and aromatic. Remove and set aside. In a large bowl, hand mix toasted pistachios, sugar, baking powder and flour. In a small bowl, whisk eggs and vanilla extract until well blended. Add to the flour mixture. Toss in the cherries. Stir a few times. Work the batter together with lightly floured hands. The mixture will be sticky, but persevere. Keep squeezing the batter with your hands, until a dough starts to form. Once the dough is firm, form a ball. Divide the ball into 2 equal pieces. On a lightly floured surface, place 1 piece of dough and using your hands, roll into a log shape that is approximately 10 inches long, 3 inches wide and 3/4 of an inch high. If it's sticky, simply dust your palms with more flour. Repeat with remaining three pieces of dough. Place two logs per baking sheet. Brush loaves all over with 1 lightly beaten egg. Bake for 40 minutes, turning the pan around halfway through, or until the tops of the loaves are shiny and deep golden. Cool on a rack for about 20 minutes before slicing. Place a loaf on a cutting board. Using a large serrated knife, cut 3/4-inch-thick slices, either straight or on the diagonal. Use a sawing motion to prevent crumbling. Each loaf should yield 9 to 11 cookies. If the cookie is crumbling, then let it cool a few more minutes. Don't let it rest too long, however, or it could become too hard to slice. Place slices on their sides back on to the baking sheets. Reduce oven temperature to 200 degrees, and bake biscotti for 20 minutes, until toasted and crisp. If you desire, you can turn off the oven and let the biscotti stay for up to an hour. The longer they stay in the oven, the harder they will become. Remove from oven and cool completely before storing in an airtight container, preferably a tin, which helps keep them crisp. Stored properly, biscotti will last up to a month. Like peanut butter and Fluff, espresso and chocolate were destined to be together. To create a full-bodied coffee flavor, I use espresso powder, coffee extract and a Kahlua icing. Espresso powder, made from used espresso grounds that are dried and crushed into a fine powder, is ideal for baking. It's available at Italian specialty markets and many supermarkets. If you can't find it, buy espresso beans and grind them as finely as possible -- you don't want large, granular pieces in the cookies. If you choose not to ice the biscotti (though you really should), then I suggest adding an additional 1/4 to 1/2 cup light brown sugar to the batter for added sweetness. Place almonds in a single layer on a baking sheet and toast in the 350-degree oven at 350 degrees for 8 to 10 minutes, or until just golden and aromatic. Remove and set aside. In a large bowl, hand mix toasted almonds, sugars, baking powder, flour, cinnamon and espresso powder. In a small bowl, whisk eggs. Whisk in coffee extract. Add to the flour mixture. Stir a few times. Work the batter together with lightly floured hands. The mixture will be sticky, but persevere. Keep squeezing the batter with your hands until a dough starts to form. Once the dough is firm, form a ball. Divide the ball into 4 equal pieces. On a lightly floured surface, place one piece of dough, and using your hands, roll into a log shape that is approximately 8 inches long, 2 inches wide, and 3/4 of an inch high. If it's sticky, simply dust your palms with more flour. Repeat with remaining three pieces of dough. Place two logs per baking sheet. Brush loaves all over with 1 lightly beaten egg. Bake for 40 minutes, rotating pans halfway through, or until the tops of the loaves are shiny and deep golden. Cool on a rack for about 20 minutes before slicing. Place a loaf on a cutting board. Using a large serrated knife, cut 3/4-inch-thick slices, either straight or on the diagonal. Use a sawing motion to prevent crumbling. Each loaf should yield 9 to 11 cookies. If the cookie is crumbling, then let it cool a few more minutes. Don't let it rest too long, however, or it could become too hard to slice. Place slices on their sides back on the baking sheets; place in the still warm oven with the temperature off and the door closed for 30 to 60 minutes. The longer they stay in the oven, the harder they will become. Remove from oven and cool completely. To make the chocolate dip, pour bittersweet chocolate chips in a double boiler over low heat (if it's too hot, it will cook the chocolate). As soon as the chocolate begins to melt, remove it from the heat and stir with a spoon until it becomes silky. If you don't have a double boiler, then microwave the chocolate on high for no longer than 30 seconds at a time, stirring in between. You don't want it to cook. Dip the bottom of the biscotti in the chocolate, letting any excess drip back into the bowl, then place on a sheet of parchment or waxed paper. You may use a little less or a little more chocolate, depending on how many biscotti you slice. Allow the chocolate to harden completely before glazing cookies. To make the Kahlua icing, whisk the confectioners' sugar and Kahlua in a small bowl. Add a few drops of milk, and continue whisking briskly until the icing is smooth and opaque and clings to the back of a spoon. Taste. Add more Kahlua and/or confectioners' sugar, if desired. Dip a teaspoon into the icing and drizzle the spoon back-and-forth over the biscotti. Allow to dry completely before storing. Store biscotti in an airtight container, preferably a tin, which helps keep them crisp. Place parchment paper or waxed paper between layers of cookies to protect the chocolate and icing. Stored properly, these biscotti will last up to 2 weeks. After that, the chocolate may begin to appear chalky. Rich, nutty, iced maple walnut biscotti paired with a steaming mug of coffee is a classic New England favorite. I have made these biscotti with both maple extract and pure maple syrup and find that the extract lends a more robust maple flavor. If you'd rather use maple syrup, then start with 1/4 cup. You'll need to add a bit more flour, though, since the syrup will make it wetter. As for the icing, I prefer syrup. Place walnuts in a single layer on a baking sheet and toast in the 350-degree oven for 10 minutes. Transfer to a cutting board and coarsely chop. Set aside. In a large bowl, hand mix toasted walnuts, sugars, cinnamon, baking powder and flour. In a small bowl, whisk eggs. Add maple extract and whisk until well blended. Add to the flour mixture. Stir a few times. Work the batter together with lightly floured hands. The mixture will be sticky, but persevere. Keep squeezing the batter with your hands, until a dough starts to form. Once the dough is firm, form a ball. Divide the ball into 4 equal pieces. Place slices on their sides back on to the baking sheets; place in the still warm oven with the temperature off and the door closed for 30 to 60 minutes. The longer they stay in the oven, the harder they will become. Remove from oven and cool completely before storing in an airtight container, preferably a tin, which helps keep them crisp. Stored properly, biscotti will last up to a month. To make the maple icing, mix the confectioners' sugar and maple syrup in a small bowl and whisk briskly until the icing is smooth and opaque and clings to the back of a spoon. Taste. Add more maple syrup and/or confectioners' sugar, if desired. Dip a teaspoon into the icing and drizzle the spoon back-and-forth over the biscotti. Allow to dry completely before storing. Store biscotti in an airtight container, preferably a tin, which helps keep them crisp. Place parchment paper or waxed paper between layers of cookies to protect the icing. Stored properly, these biscotti will last up to 2 weeks. After that, the icing may begin to appear chalky.